Already have your own project? Fullstack serverless apps comprise of backend resources such as GraphQL APIs, Data and File Storage, Authentication, or Analytics, integrated with a frontend framework such as React, Gatsby, or Angular. Deploy these example projects to the Amplify Console with a single click. This auth starter implements withAuthenticator HOC to provide a basic authentication flow for signing up, signing in users as well as protected client side routing using AWS Amplify. This auth starter implements withAuthenticator HOC to provide an authentication flow for signing up, signing in users as well as protected client side routing. Create a notes app that will provide user authentication, in-app analytics, and will be connected to a serverless GraphQL API. Collaborative real-time canvas built with GraphQL, AWS AppSync, & React Canvas Draw. 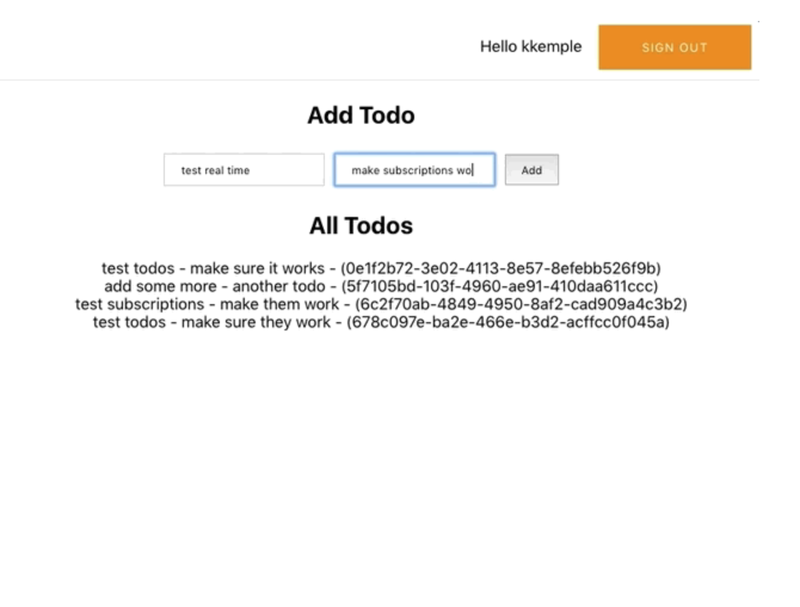 A simple Todo app built with GraphQL and authentication (sign-in/sign-up/MFA workflows). Deploy frontend-only projects (with no backend functionality) with frameworks such as Gatsby, React, Angular, or Hugo.